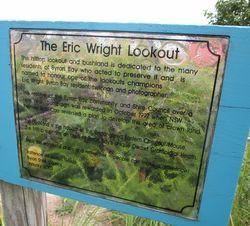 The Paterson Street Lookout was renamed in honour of local historian and long term resident of Byron Bay, Eric Wright in 2002. The hill was the site of a nine year protest by locals to protect the bushland from encroaching residential development. Mr Wright`s photographs and knowledge of the area were pivotal in convincing Premier Bob Carr, not to proceed with development plans for the Crown Land. 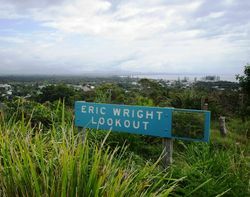 This hilltop lookout and bushland is dedicated to the many residents of Byron Bay who acted to preserve it and is named to honour one of the lookouts champions Eric Wright, Byron Bay resident, historian and photographer. The resolve of the Byron Bay community and Shire Council over a nine year campaign was awarded in October 1997 when NSW Premier Bob Carr reversed a plan to develop this area of crown land. This bushland is the habitat of the endangered Eastern Chestnut Mouse. The hilltop supports an area of Byron Bay’s unique Dwarf Gramoidial Heath. Enjoy this place and remember - people can make a difference!